Kharagpur: IIT KGP, the first IIT, is setting up a first of its kind Center of Excellence in Artificial Intelligence Research. This covers education, training, research, projects, incubation and entrepreneurship in AI and related domains. The Center will be seed funded by Capillary Technologies Limited, for an amount Rs. 5.64 crore for setting up computing infrastructure, hardware simulation platforms, software and designing the coursework. “IIT KGP has developed a deep expertise in the overall area of Artificial Intelligence, Machine Learning, Data Sciences and its applications in several critical domains over a long period of time, among others. It is time that we lead this initiative in AI to fulfill the need of AI technologies in the 21st century” said Prof. P P Chakrabarti, Director, IIT Kharagpur. IIT KGP would start the Center with teaching and learning and knowledge dissemination program. Faculty from the Institute, Capillary specialist and deep-learning industry experts would work together to prepare the curricula. The Well-planned curriculum will include short-term credit courses and certificate program for internal and external students and industrial training programs. The Institute has already taken initiative to create infrastructural facilities and programs for the Center. “The way we look at AI, it is the future not just in our industry but in every aspect of life. We wish to support the envisaged programs of the AI Center in various ways. Over the last few years, we have invested over Rs 40 lakh annually in various research projects that hold the promise of shaping the future of our industry. We wish to continue our association with IIT KGP by investing a similar amount over a period of time to make this AI Center a truly industry-leading one.” said Aneesh Reddy, Co-Founder and CEO, Capillary Technologies. Capillary Technologies has been a major motivator towards setting up this Center of Excellence in Artificial Intelligence Research at IIT KGP. The company was incubated at IIT KGP and has worked towards becoming an industry leader in the domain of cloud-based Customer Engagement, e-Commerce platforms and related services. It has already supported such activities in IIT KGP through funded projects for developing AI applications in retail sector, manpower training modules, internships, recruitment and enabling industry as well as government engagement. “The Institute already has AI experts in the domains of Digital Healthcare, Industrial Automation, Intelligent Transportation System, Intelligent Urban Infrastructure, Financial Analytics, Agricultural Internet of Things and Analytics, Safety Critical Cyber Physical Systems, Big Data Analytics for rural development, climate studies and oil and gas. These experts will work towards developing new AI technologies for various domains and also aligning them with these domains through custom applications, interfacing, training etc.” explained Prof. Pallab Dasgupta, Dean Sponsored Research and Industrial Consultancy, IIT Kharagpur. 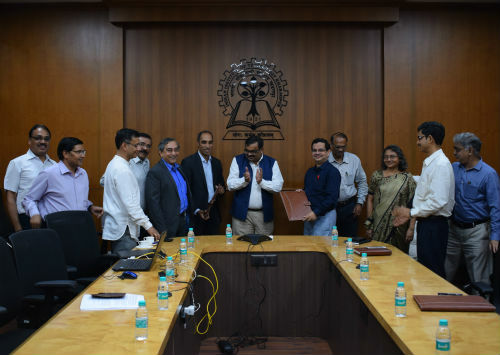 Prof. Sudeshna Sarkar, Head, Department of Computer Science and Engineering along with the departments of Electronics and Electrical Communications Engineering and Electrical Engineering would be driving initiative at IIT Kharagpur. From Capillary Mr. Subrat Panda, Head of AI Technology and Pravanjan Choudhury, CTO would be leading the initiative.